Three pre-health professional students describe their journey and hardships on the path to medical school. From left: Preston Powers, Catrina Tegen, Joe Bartoletti. 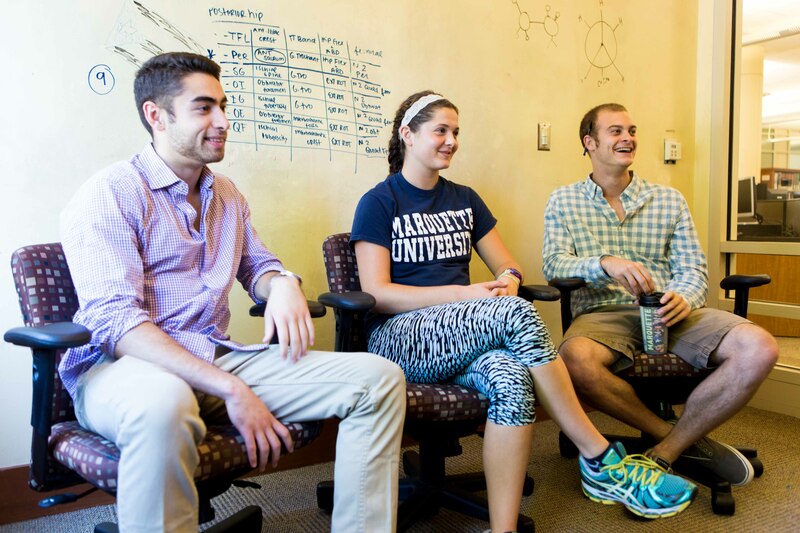 Three Marquette biomedical sciences students share their journey to medical school. When he isn’t climbing volcanoes in El Salvador, biomedical sciences senior Joe Bartoletti is spending his time in science and Spanish classes, working as a teaching assistant in anatomy labs, doing service in Milwaukee area clinics, and researching with faculty in his college. He just finished applying to medical schools and is waiting to be called for interviews. His dream: to work with marginalized patients in medicine, particularly Latin Americans. Last spring, it was Bartoletti who paced between rows of cadavers as a TA in Marquette’s gross anatomy labs as Preston Powers, a junior in the College of Health Sciences, peered at the heart in his body donor’s open chest. Today, Powers races from class to class while also gathering clinical volunteer hours, trying to get his research published and studying for the Medical College Admission Test. That is, when he isn’t disc jockeying events. Meanwhile, wide-eyed biomedical sciences sophomore Catrina Tegen sits in her first Marquette anatomy course with a hundred of her peers. Still in the early stages of her pre-medical path, she’s more enthusiastic about her studies. Whether she’s spending late nights studying in the library, working as a certified nursing assistant, or trying to secure a spot at a clinic for the uninsured, Tegen finds the whole thing, in a word, romantic. Tegen thinks back to her experience over the summer as a CNA and how she was unable to help patients with certain things because she lacked the qualification. “I want to be that person that can help them,” she says. It goes without saying that what Bartoletti, Powers and Tegen are trying to accomplish is not easy. In 2014, the Association of American Medical Colleges reported that of 49,480 applicants to medical school, 20,343 enrolled, putting the rate of enrollment at just above 40 percent (the rate is on an upward trend). Getting in depends on a plethora of criteria, including an applicant’s resume, letters of recommendation, grades, Medical College Admission Test score, clinical hours and how well they do in the interview. Location matters, too. Medical schools leave more spots open for in-state students with the hope that they stay to practice where they study. Laurie Goll, the pre-health professions adviser at Marquette, said public funds heavily support some medical schools. Even the date students submit their applications can measurably affect their chances of getting in. “If you have a 4.0 student who has a really high MCAT score, say they’re in the 90th percentile, if that person doesn’t submit their primary (American Medical College Application Service) application by September or October, they might not get in,” Goll said. This is because the colleges accept people on a rolling basis. In other words, the earlier you submit, the better your chances are of getting in. There’s also the matter of doing well on the MCAT in the first place, which undergraduate students most often take junior year. As it turns out, a good score requires more than the ability to know the information; it also relies on endurance. The new exam is seven and a half hours long and consists of four parts which require everything from what a student learned in first semester biology class as a freshman, to writing and critical reasoning skills. Goll said that out of a possible score of 528, she encourages students to aim for 500 or higher, which would put them in the 60th percentile. Then, they spend all summer applying. Students have much more versatility than some might expect — they won’t pick a specialty until they leave medical school to start their residency. For now, students fill out the AMCAS application and then wait for the colleges to release secondary (college specific) applications later in the summer. Interviews begin early in their senior year. Goll said that she recommends students apply to 10-15 colleges. It turns out that the key to getting into medical school has many teeth, one of which is to be a well-rounded and well-meaning person. Marquette’s mission to make its students “men and women for and with others” may be helping students in more ways than they know. “I think what makes Marquette students stand out so much is their commitment to service,” Goll said. She listed off some of the organizations the students she worked with were involved with, in and outside of the medical field: volunteering at urban clinics, participating in Midnight Run, and tutoring in inner city schools.